Since the airing of the Quilt Show on Monday, I've had several questions regarding my use of starch. I was really skeptical when I first had someone tell me that starching the fabric before cutting was important for accuracy. Because I mostly hand quilted everything at that time, I didn't want that stiffness to interfere with my ability to make tiny stitches through all 3 layers. But it you don't try something, you'll never know, so I tried it and I liked it! Starch softens as you finish the quilt top. In the beginning, it really aids in precision piecing and applique work, too. By the time you get to the hand quilting part, the starch literally disappears, especially if you have high humidity where you live. 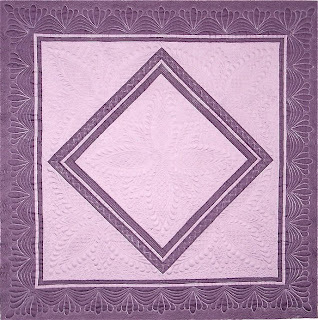 In my opinion, it doesn't affect the ability to hand quilt a piece at all. I use a liquid starch (Sta-flo brand) that is really economical. The spray in the cans is cheap, but by volume in comparison, it is expensive. Plus I am sensitive to the propellents in sprays. I mix the liquid starch one-to-one with water in an inexpensive plant mister bottle, and spritz it on the fabric. Then I press it with a hot, dry iron until completely dry. You have to be very careful at this stage not to distort the fabric. If the fabric piece is larger than a fat quarter, I mis the starch and water in a bathroom sink and soak the yardage, then squeeze out the excess, and roll the fabric in a towel to absorb even more. In our dry climate, I let the piece air dry briefly until it is a little damp before pressing. This is all done before cutting the pieces. The starch facilitates rotary cutting. The fabric doesn't creep ahead of the cutter's blade, and you get a very clean, crisp edge that doesn't ravel. 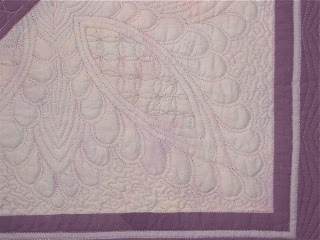 My long-arm quilter Shirley Gingerich was so surprised, too, at what a difference it made in her ability to machine quilt one of my tops. She says she now recommends to all her customers that they use a little starch on their tops for the final pressing. If you are concerned about the little critters out there that love to feast on starched fabric, you will want to launder the finished quilt. Because my hand-quilted quilts are sometimes in the works for several years, and are drug around with me in the back of the car, or from room to room in my house, they get quite grungy. I make is a practice to launder my finished quilts anyway to remove the dirt and build-up of hand oils. 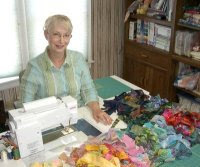 Try starching your fabric before cutting your pieces. I think you'll like it. Sorry, you'll have to copy and paste the link to the pattern. 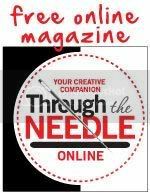 The blog format will not allow a clickable link. Still learning! If you are using blogger, type the text that you want to appear clickable. Then select it by clicking and dragging over the text. Click on the link button - it looks like a sideways figure 8 with a green background - and enter the URL into the box that pops up. Click ok & your clickable link is done. Thank you for the tips on starch. I always thought it would interfere with hand quilting, too. Now I know! And thanks, Zegi, for the instructions for links in the blog. So new to this, it may take some time to get it all down! I have loved your quilts for a while. Do you have a class schedule or calendar somewhere? I love your work, and now I might try some of that starch....heck, I'll try anything once! Thanks, everyone out there. It's reassuring that you have found my blog. Avon, yes, my calendar is now online. I think there is a link on my index (home) page that you can click on. Check it out. If you can't open it, e-mail me.